Thandai Cheesecake is a no bake cheesecake recipe with oreo biscuit and waffle crumbled to form the base. 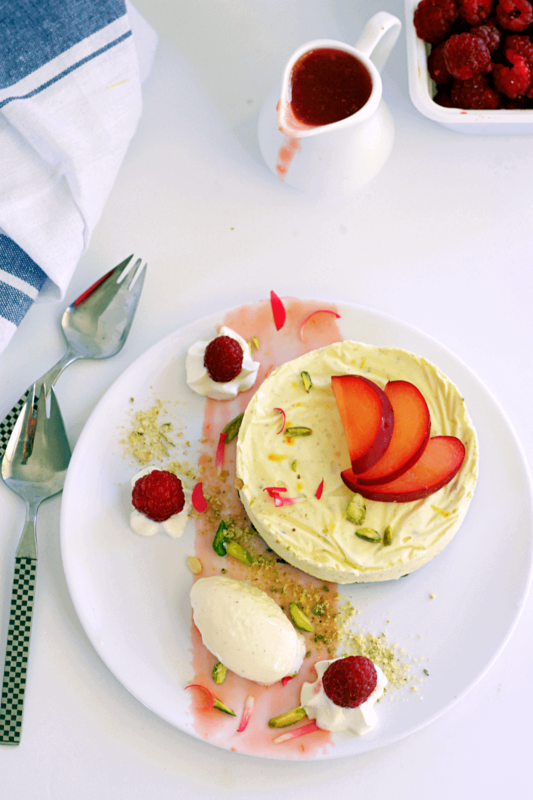 Cheesecake is flavoured with thandai masala. Bura na mano HOLI hai!!!! Holi is an Indian festival celebrated to mark the arrival of spring and like most other festivals to celebrate the win of good over evil. What holi reminds me – a get together with friends playing with colours and eating good food!!! Now that I am a blogger it makes me wonder how we associate all occasions with the food that we had. 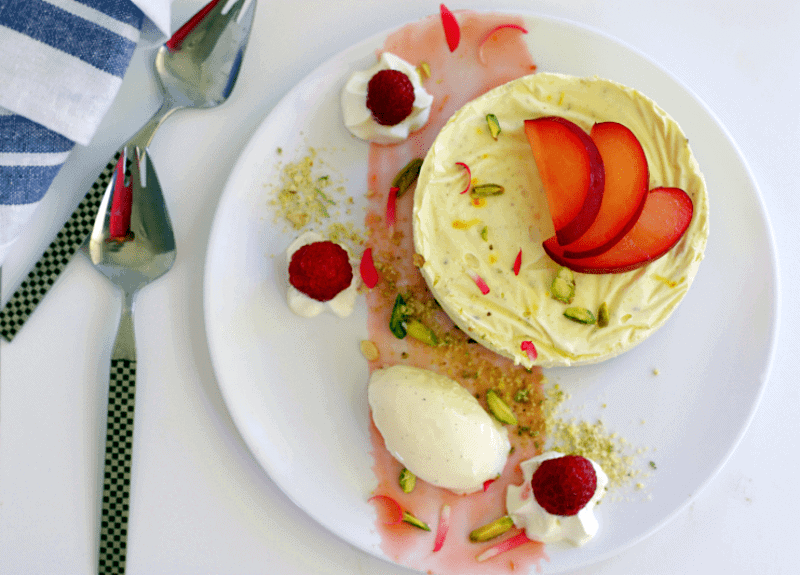 What is so special about this Thandai Cheesecake?? 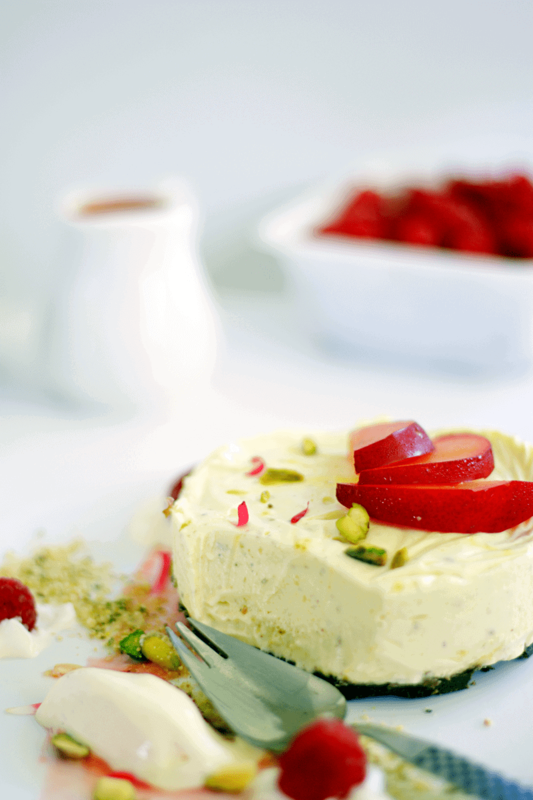 Well thandai cheesecake is basically a fusion recipe of gold old traditional practise. I mean Thandai is a cold Indian drink that is associated with Holi. I used the masala that goes into making of Thandai with cheesecake; a very western recipe to make this amazing delicious Thandai Cheesecake. So all you need to do is make Thandai Masala first. I have a recipe on the blog for the same. You just need 5 minutes to make it. Its that simple!! 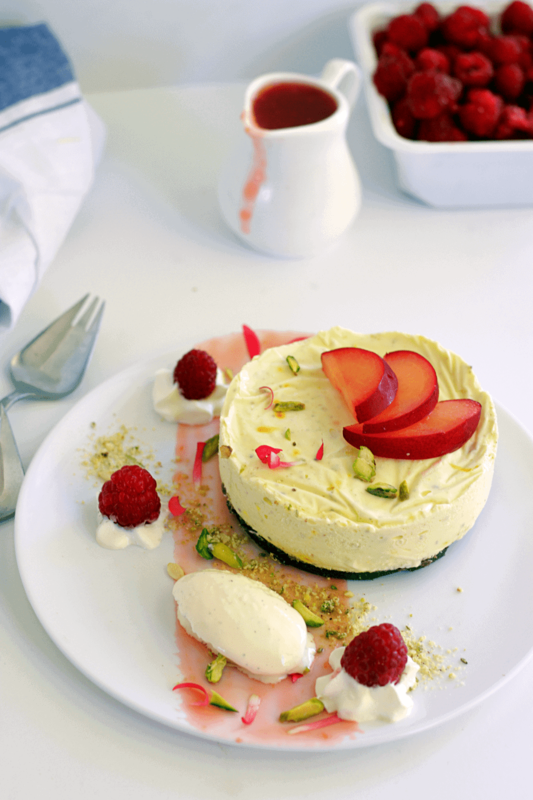 Then follow any cheesecake recipe you like just add 2-3 tbsp of thandai masala to make it Thandai Cheesecake. Simple Ain’t it??? The recipe that I am sharing today is a no bake making it even more easier to follow. Yup you heard it right. 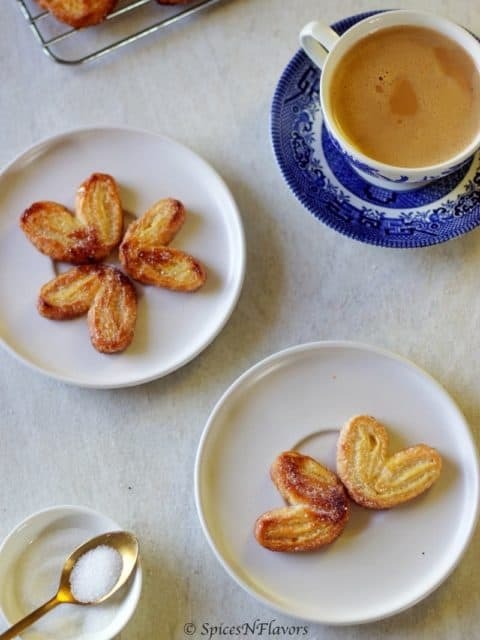 This recipe is actually a very basic one but presented beautifully making it perfect for you to serve to your guests on Holi!! And yes you can make it ahead of time as well. I have made a mini version you can ofcourse double to recipe to make it in an 8 inch or 9 inch pan. 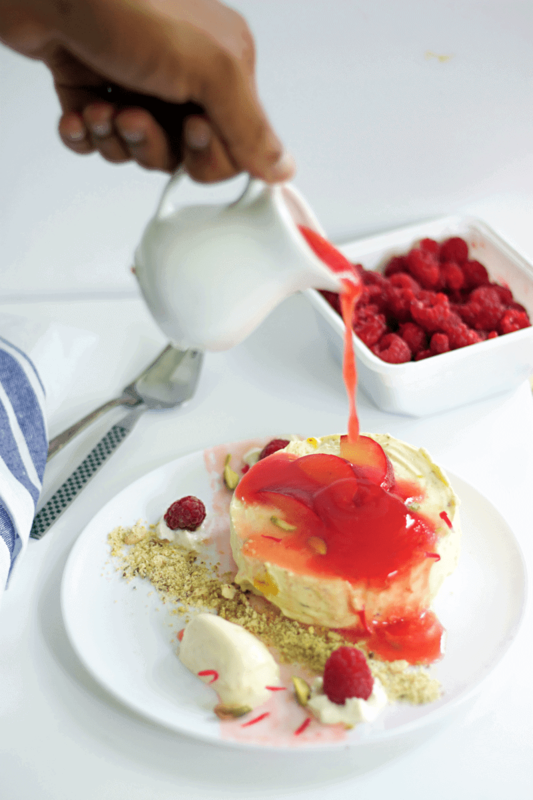 To me this Thandai Cheesecake tasted really sweet so I made a tart sauce to go with it. Tartness is know to cut the sugar a bit and the plum compote balanced the entire dish. Also like since Thandai masala has so many different kind of nuts in it; it was really heavy. I mean the mini version could easily be shared between 2 people. I couldn’t finish the entire cake by myself. Both me and my husband shared it between us. Plum compote is basically a reduction of plum in sugar water and flavoured with spices like star anise and orange zest. This in itself is so flavourful, that you can pair it with many other dishes like pancakes or vanilla ice-cream. In short this thandai cheesecake was a bit sweeter but the pairing with plum compote made it a balanced dessert. The coarse bite of the nuts, saffron, rose petals and the best quality vanilla ice-cream and fresh fruits made it look so festive and at the same time so flavourful and delicious. 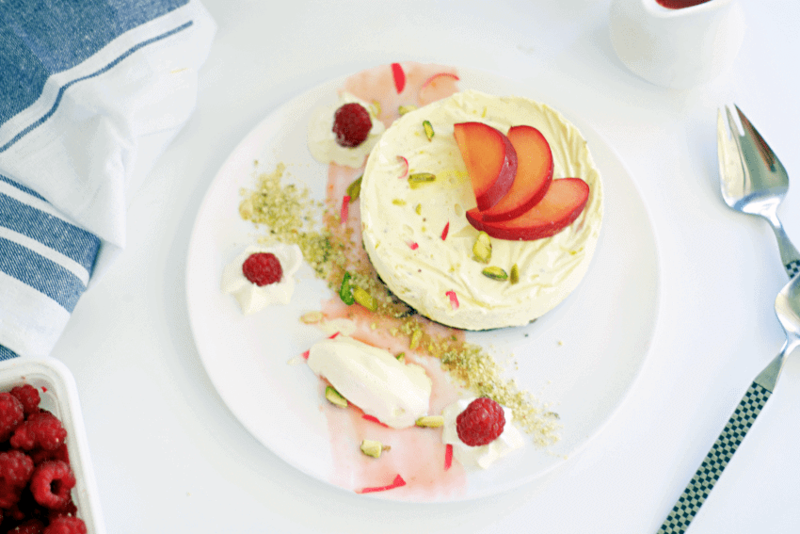 And as always if you happen to try this fusion Thandai Cheesecake recipe then do tag me tweet me or instagram me. I would love to follow you and your posts. 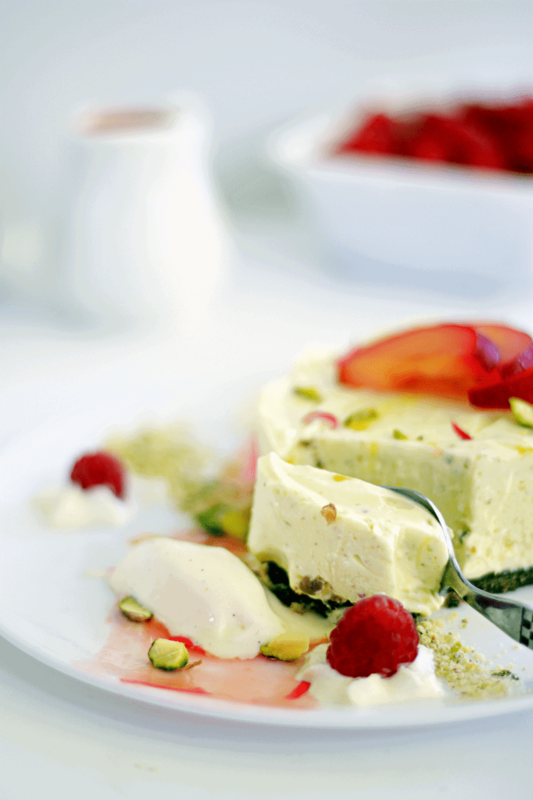 Thandai Cheesecake is a fusion dessert for Holi combining Thandai Masala in Cheesecakes. Add everything to the blender except the butter and pulse everything to a sand like consistency. Add the melted butter and combine so that it resembles wet sand. Divide the mixture is between two tins and press this onto the base of the mini cheesecake or cake tin. You could also use just oreos to line the base, I just had 3 oreos so added almonds and waffle cones to it; wont complain as it tasted really good. Add the saffron strands to hot milk and let sit for 15 mins. Meanwhile whip cream cheese, sugar, rose water, vanilla, lemon zest until soft and creamy. Won't take more than 2-3 mins. Add thandai masala and the saffron milk mixture and give a good mix. 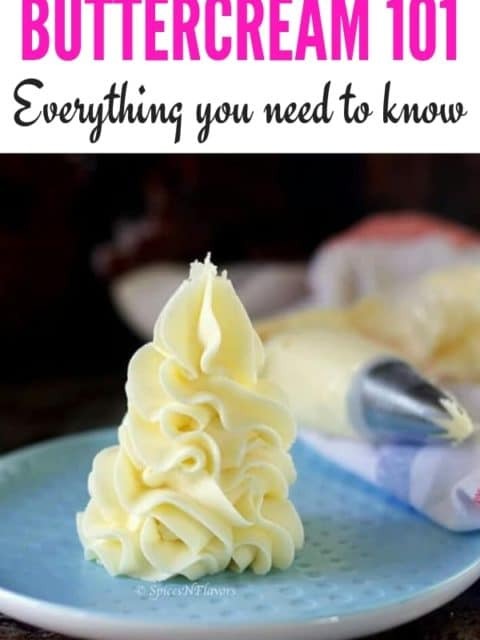 Whip the cream until stiff peaks and combine the cream cheese to the whipped cream in three parts with soft and gentle hands. Divide the mixture in two and pour it on top of the cheesecake base. Cover with the cling wrap so that the wrap touches the cheesecake and let it set overnight in the refrigerator. Heat everything mentioned in the ingredients above for plum compote in a saucepan until it reduces to half of what you started with. And that is your plum compote. Take a white or black plain serving dish. With a pastry brush, brush the plum compote in the centre of the base. Place the thandai cheesecake on top to one side. 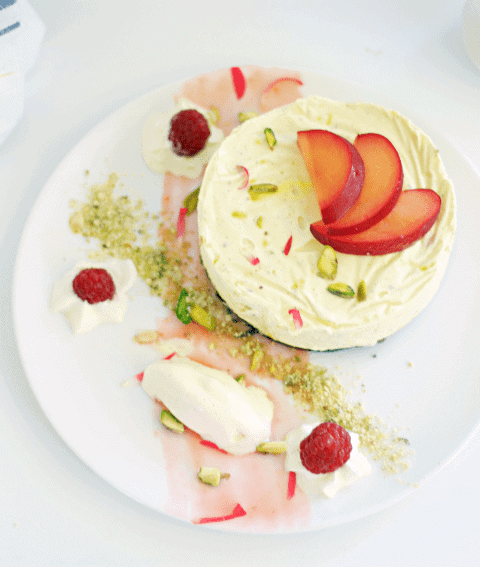 Garnish with rose petals and pistachios. Put some thandai masala powder. Add whipped cream, vanilla ice-cream and fresh fruits. And thats it your thandai cheesecake is ready. Hope you have a safe and fun filled Holi this year!! Hi…can we use any other fruit in place of plum. U mentioned to divide the whipped cream n cream cheese mixture in two parts in point no.5. Can u plz clarify what u did with the remaining half quantity. Hi priya.. Sure you can use any sour or tart fruits instead of plums like strawberries, raspberries, peach etc. Since this cheesecake is heavy and sweet you need a sauce that is sour enough to cut the sweetness or else you can reduce the amount of sugar and give it a try..
Hi sushma, no agar agar or gelatin used!! Can you tell me how to make thandai masala? Hi. This recipe is quite interesting and I am planning to try it out on Holi. Can I get this recipe in grams? I am a professional pastry chef and don’t understand ambiguous recipes in cups etc. Hi Surbhi.. 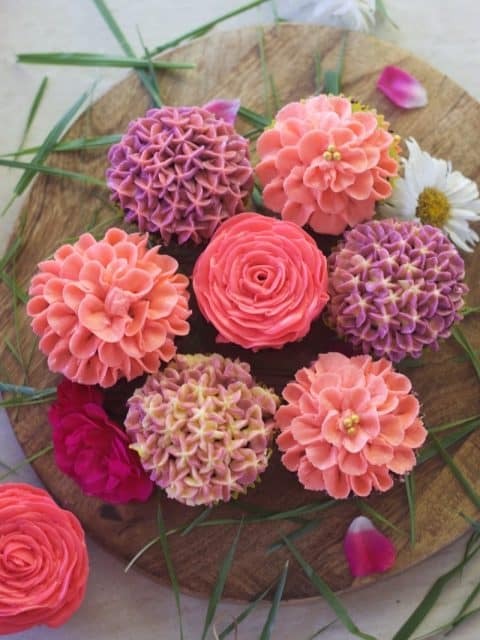 Happy to connect with you..
Hii Sushma, this cake looks toooo good. I am definitely gonna try ?? Hey dear.. Hope you received my message on instagram. I used a 3″-4″ cake tin. You can also use a bigger cake tin to set it; wouldn’t really make a difference except for in the height. Or as you mentioned just halve the recipe. 1) I have a 9 inch springform bakeware, will it complement the quantity of ingredients involved? 3) I don’t like cocoa/chocolate of any kind. Is there something else I can use instead of Oreos? Can I replace them with graham cracker? Thanks a lot and wish you a very happy holi in advance! I feel so terrible for not replying back to you on time. Extremely sorry for the delay in my response. I am in India for a vacation so travelling and stuff and hardly doing any blog related stuff from here. 1.So you can use a 9 inch bakeware for the same but I guess you will have to double the recipe as this makes just 2 mini cheesecakes. 2. You can also use dried rose petals which is easily available on Amazon: http://amzn.to/2p5Xx9K. Or maybe skip it completely. 3. Yes definitely you can use graham crackers as the base. Once again sorry and thank you for dropping by. Hi Sushma tried this too.It tasted very good.Thanks for recipie.I used strawberries in place of plums as I could not get them.I kept it in fridge to set for 24 hours but it didn’t set well,had to keep in freezer for few hours.I followed the recipie to T,beat the cream to hard peaks too.Can you suggest me where I went wrong. That sounds great yaar.. thank you so much for taking the time out and trying the recipe and sharing your wonderful feedback with us.